Born at Dyhernfurth; son of Ẓebi Hirsch ben Meïr (No. 2). In 1731-32 he worked in the establishment of Israel b. Abraham in Wandsbeck, near Hamburg, and after 1733 in Berlin. He published a prayer-book in 1742. Until 1782 he was engaged partly in Berlin and partly in Frankfort-on-the-Oder, so that his career as a printer extends over a period of nearly fifty years. Bornat Brzecz, Lithuania; from 1701 to 1709 he was engaged in several printing-establishments at Berlin; in 1708 he worked at Frankfort-on-the-Oder; and from 1719 to 1720 with Joseph Bass at Dyhernfurth. Printer in Frankfort-on-the-Oder from 1788 until 1813 or later. He translated Jedaiah Bedersi's "Beḥinat 'Olam" into German (Frankfort-on-the-Oder, 1802), and published a new edition of Arama's "Ḥazut Kashah," on the harmony of tradition and philosophy. A sermon delivered by him at Frankfort-on-the-Oder on the conclusion of peace, Jan. 18, 1816, also appeared in print. It is in dispute whether the epistolary guide ("Ready Letter-Writer"), published at Frankfort-on-the-Oder in 1789, is to be attributed to him. 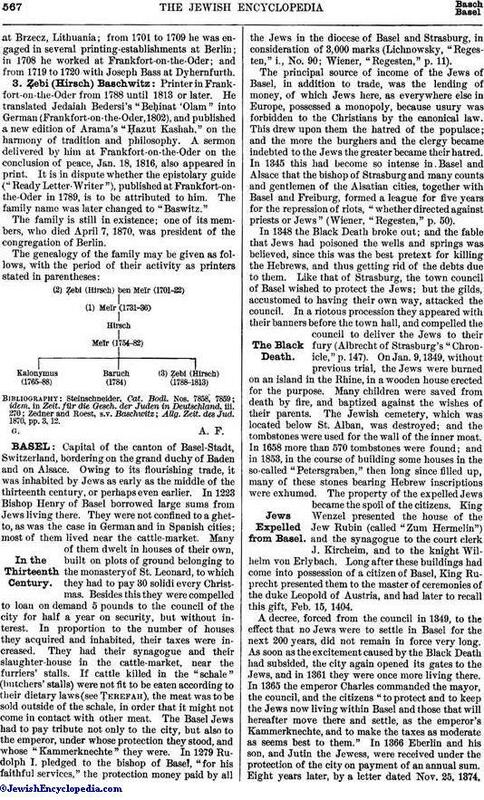 The family name was later changed to "Baswitz." 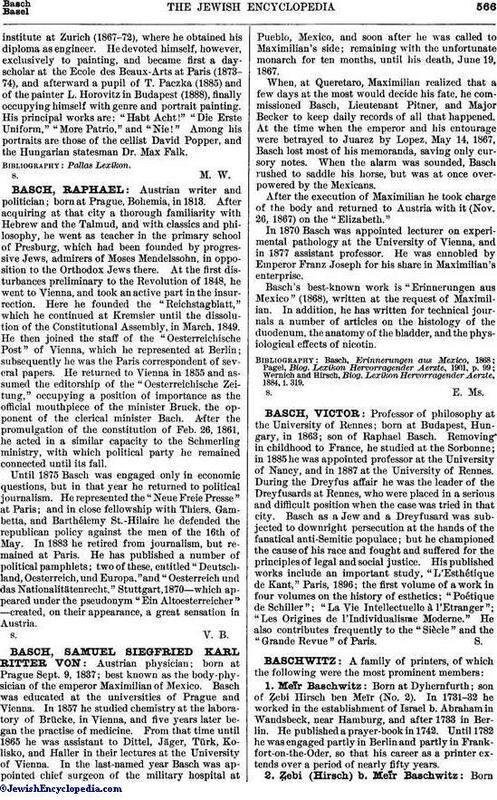 The family is still in existence; one of its members, who died April 7, 1870, was president of the congregation of Berlin. Allg. Zeit. des Jud. 1870, pp. 3, 12.